Hope you enjoy the final of three guest posts & photos by Alden Gewirtz below, highlighting his experience at Screaming Beans in Amsterdam! To the uneducated American traveler, Amsterdam might not seem like a destination for quality coffee (cannabis-selling “coffee shops” of Amsterdam not withstanding), but Googling a bit about The Netherlands’ history in the coffee trade reveals that the Dutch imported Arabica coffee plants from Yemen in the 17th Century and grew varieties in Indonesia for export back into Europe. The history is quite rich, so I was surprised not to have heard more about it. 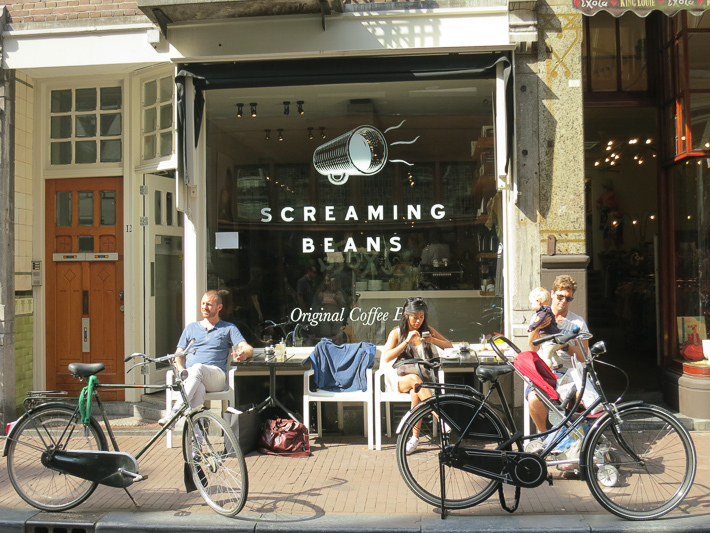 On a recent trip to Amsterdam with my family, I decided to seek out a place known locally for its coffee – Screaming Beans. We went to its original location, open since 2007 (at Hartenstraat 12, 1016 CB, Amsterdam, The Netherlands), in the now trendy, boutique-filled neighborhood of “9 Streets” (“9 Straatjes” in Dutch). 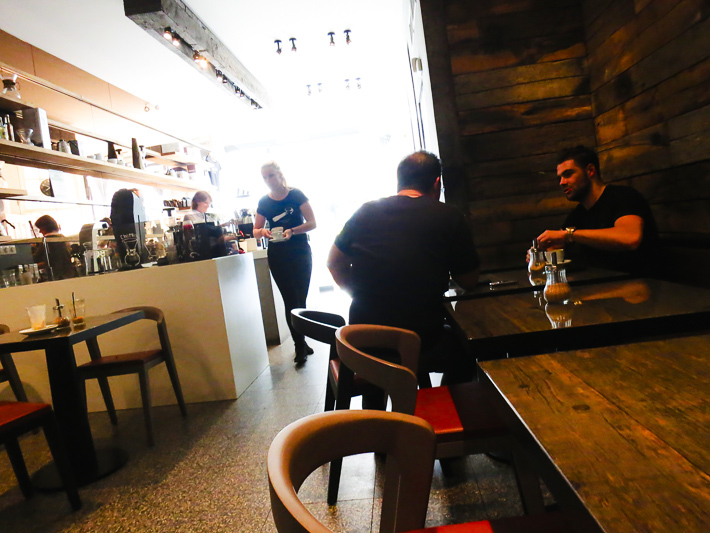 The place felt like a modern location for Vermeer painting – contrasty light, even in the early afternoon, a mix of white and reclaimed wood on different walls. 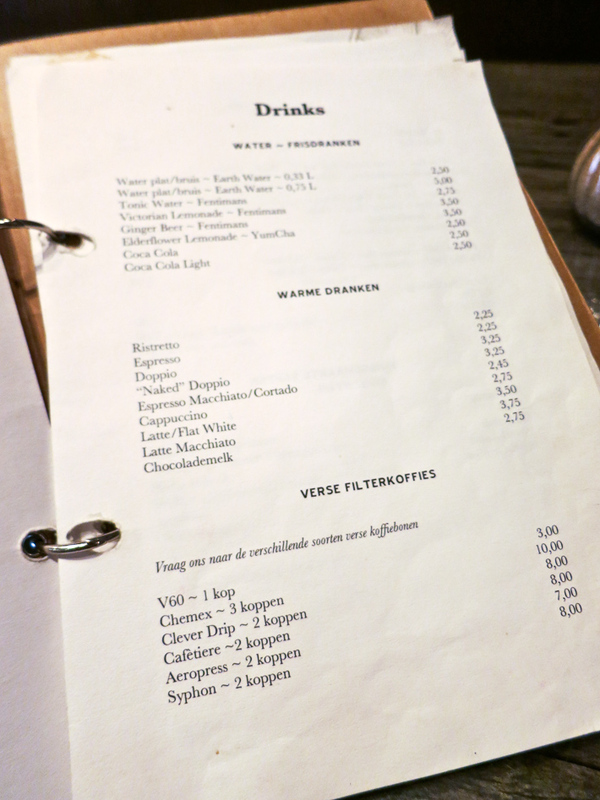 The menu, several pages long and kept in a binder, was printed in both Dutch and English, and featured not just coffee and other hot drinks, but also savory food (one of their other locations is more food-based). I decided on the V60 pour over, in this case, the mini-sized version that serves one cup of coffee. 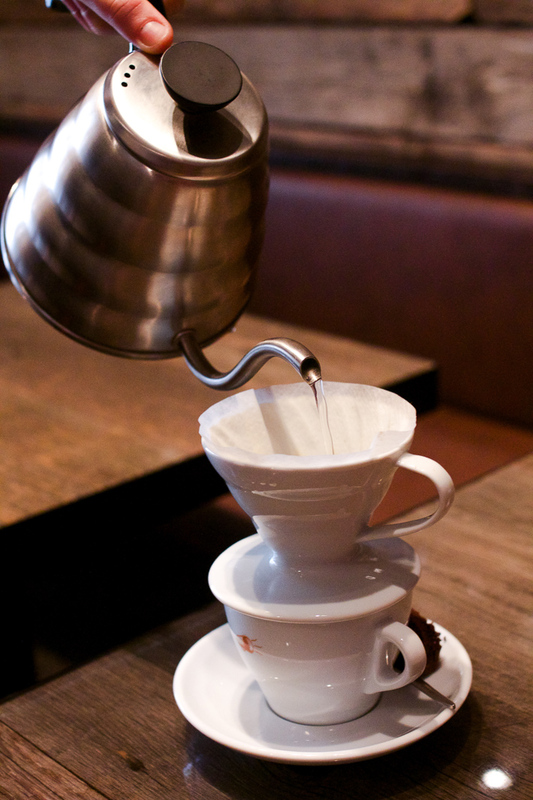 The pour-over itself was done at the table (not at the counter), and the beans they used were a Sumatran, Lintong variety. The coffee was nice, crisp, and slightly earthy, and served with a tiny brownie bite hidden on the saucer behind the cup. It was a nice surprise, reminding me of the idea of Dutch cooking chocolate. 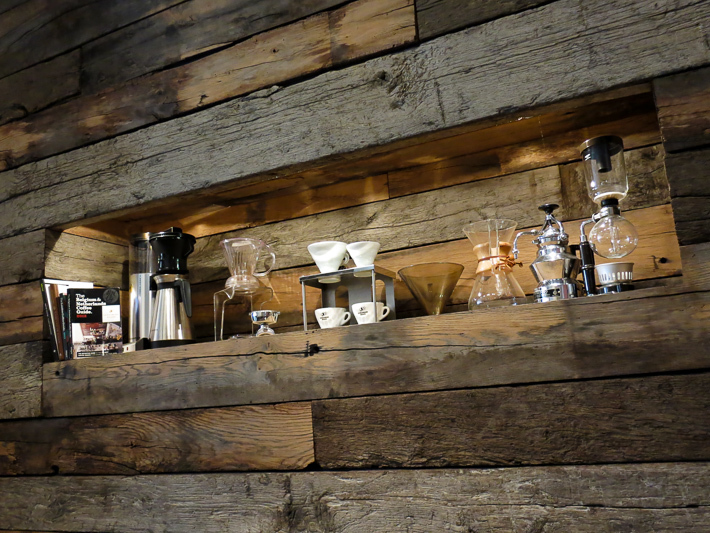 I also tried their espresso, which was a house blend that day of Costa Rican, Brazilian, and Ethiopian coffees, pulled from a Kees van der Westen lever machine. 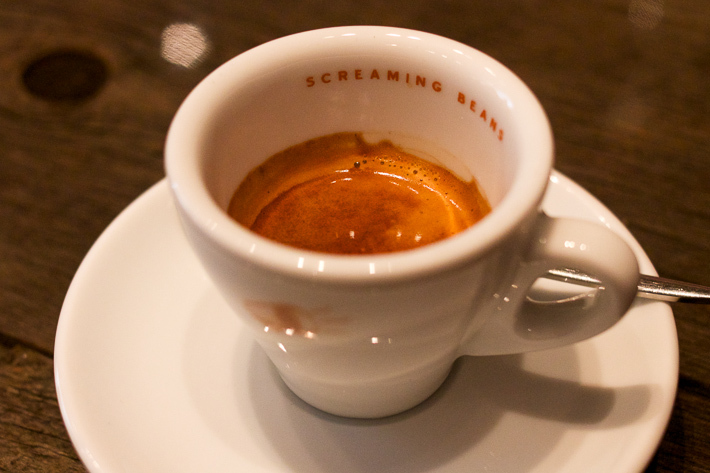 The crema on the surface was a little more brown-red (which seemed to pick up the red color of the logo), with a slightly dark and roasted taste to it that was a little harsh at the bottom of the sip. Still, not bad overall. The waitress assured me that they only served 100% Arabica beans (a source of pride at most of the coffee houses we saw in the city). 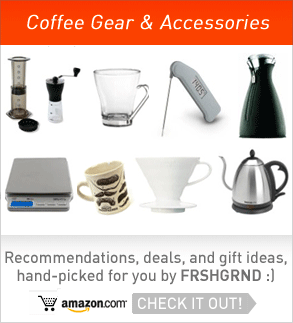 They serve locally roasted coffee beans and sell bags of it upfront at a fairly affordable price, along with branded merchandize including shirts, mugs, and bags. 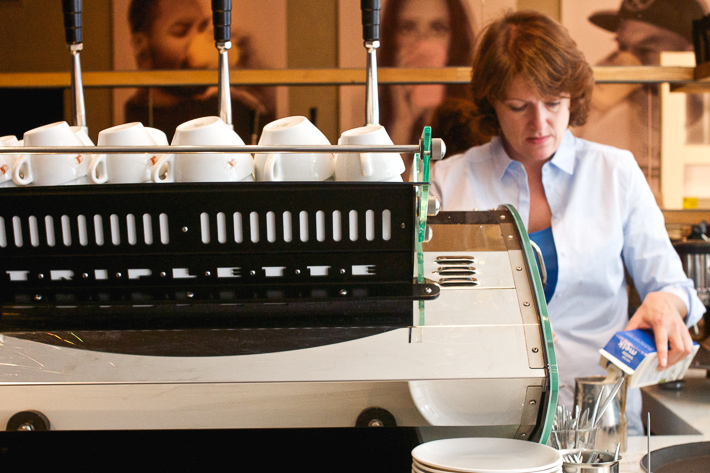 They also offer barista training at their Academy location, and have wine tastings, dinners and more at their Helmersbuurt location, near the city center, which from their website looks quite nice. Taking a broader look around, I couldn’t help but notice how carefully branded and crafted the place was, with different kinds of brewing equipment on display on the side wall, books about the history of coffee in The Netherlands, and lots of items with the Screaming Beans logo, including the mugs & espresso cups they served from, and even down to the t-shirts the servers were wearing. When we left, I noticed people having hot and iced coffee on a bench out front. Socializing outdoors on a nice day is the norm in Amsterdam. Each afternoon in the nearby Jordaan neighborhood where we were staying, we noticed locals gathered right outside their narrow homes to sip, snack, and chat. The coffee was pretty good overall (but not exceptional) by the standards set by the more recent wave of newer coffee houses in Europe, and their commitment to quality and presentation was evident, but this location felt a bit formal, like a café or restaurant, and less like a local casual coffee house that you might see in the States. Maybe it was the waiter service (which was friendly), or the equal emphasis on the food to the coffee, but still, it was a nice way to spend some time in that part of town. 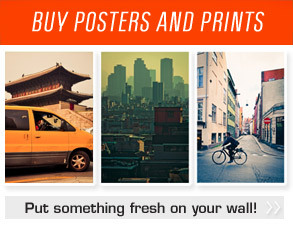 Alden Gewirtz is a photo editor based in NYC, where he has worked at Frommer’s travel guides, Zagat, and other magazines and stock photo agencies. 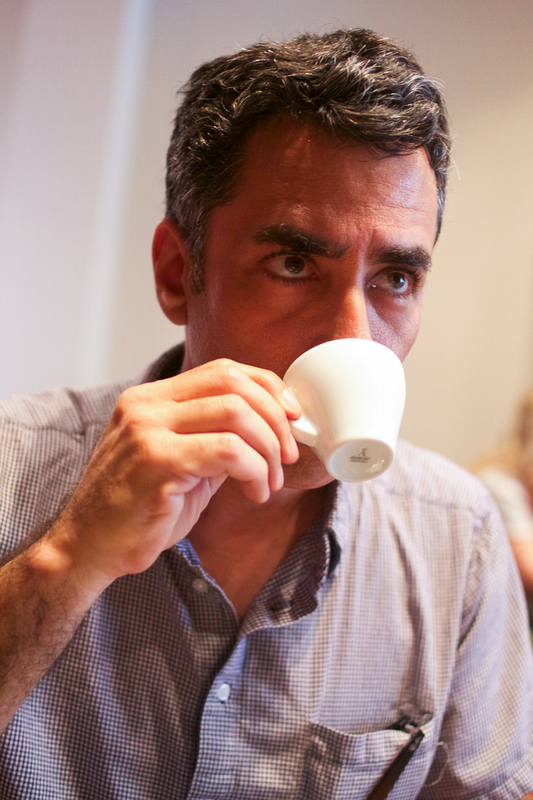 While he enjoys coffee, espresso, and lattes at his local coffee shop in Greenwich Village, at home he kicks it old school, preferring Guatemalan beans freshly ground in a French press.